this special issue of 1CENT (#173) was published on the occasion of the bpNihcol FESTSCHRIFT held in toronto at harbourfront october 14 1986. it is published by CURVD H&Z (#334) & corresponds with the simultaneous release of the FESTSCHRIFT issue of OPEN LETTER, the launch of the american edition of ONCE: A LULLABY (from Greenwillow Books) & the dispersal of a visual poem/print (from Letters & Room 3o2 Books) at the event. thanks are due to everyone who helped to make the event a success. & thanks, also, to Kevin Connolly for the sleepless day & the Coach House Press for printing this special issue. 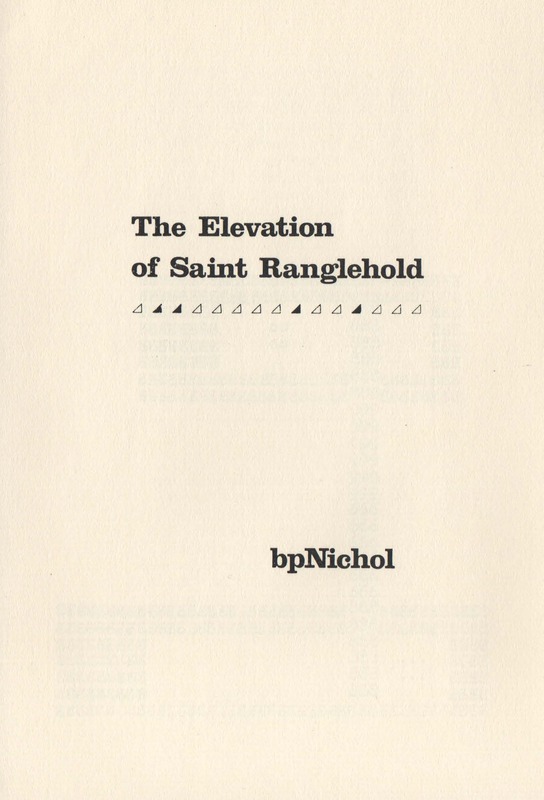 About The Elevation of Saint Ranglehold.